Shortlisted for the Man Booker Prize: A "rich, Chekhovian novel" about family and forgiveness from the acclaimed author of Fire on the Mountain (The New Yorker). At the heart of this "wonderful" novel are the moving relationships between the estranged members of the Das family (The Washington Post Book World). Bimla is a dissatisfied but ambitious teacher at a women's college who lives in her childhood home, where she cares for her mentally challenged brother, Baba. Tara is her younger, unambitious sister, married and with children of her own. Raja is their popular, brilliant, and successful brother. When Tara returns for a visit with Bimla and Baba, old memories and tensions resurface, blending into a domestic drama that leads to beautiful and profound moments of self-understanding. 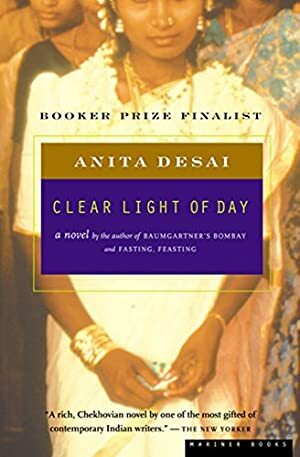 Set in the vividly portrayed environs of Old Delhi, "Clear Light of Day does what only the very best novels can do: it totally submerges us. It also takes us so deeply into another world that we almost fear we won't be able to climb out again" (The New York Times Book Review). Track It. This book has been $1.20 within the past year. Log In to track Anita Desai on eReaderIQ. to be notified each time the price drops on any book by Anita Desai. to stop tracking Anita Desai. We started tracking this book on May 5, 2014. The price of this book has changed 41 times in the past 1,813 days. The current price of this book is $9.04 last checked 9 hours ago. This lowest price this book has been offered at in the past year is $1.20. The lowest price to date was $1.20 last reached on March 15, 2019. This book has been $1.20 3 times since we started tracking it. The highest price to date was $9.99 last reached on November 19, 2014. This book has been $9.99 2 times since we started tracking it. We last verified the price of this book about 9 hours ago. At that time, the price was $9.04. This price is subject to change. The price displayed on the Amazon.com website at the time of purchase is the price you will pay for this book. Please confirm the price before making any purchases.